7/10 - Vornado Completes $260M Sale of Power Shopping Center in L.A.
of Beverly Connection in L.A.
Beverly Connection's tenant roster includes Old Navy, Nordstrom Rack, Men's Wearhouse and Marshalls. 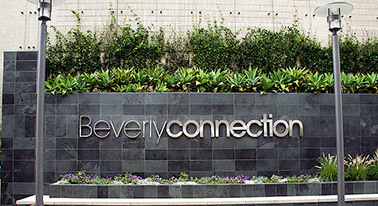 LOS ANGELES -- Vornado Realty Trust (NYSE: VNO) has completed the previously announced sale of Beverly Connection, a power shopping center in Los Angeles, for $260 million. The property's tenants include Old Navy, Nordstrom Rack, Men's Wearhouse and Marshalls. The 335,000-square-foot center is located at La Cienega and Beverly boulevards across the street from the Beverly Center, an upscale shopping mall with 160 retailers and dining options. The sales price is comprised of $239 million in cash and $21 million in 10-year seller financing. The sale resulted in a net gain of approximately $44 million for Vornado, which will be recognized in the third quarter. Vornado did not disclose the buyer, but the Los Angeles Times reported that the buyer is Ashkenazy Acquisition Corp., a New York-based private real estate investment firm. Michael Alpert, president of Ashkenazy Acquisition Corp., revealed that the company plans to invest an additional $500 million in the greater Los Angeles area in the near term. The company owns more than 100 retail, office and residential properties in the United States and Canada valued at $5 billion. Vornado Realty Trust is a fully integrated equity real estate investment trust (REIT) based in Paramus, New Jersey. Vornado's U.S. portfolio spans 100 million square feet, with the majority of properties located in New York and Washington, D.C.
Vornado's stock price closed Wednesday at $106.37 per share, up from $85.47 per share this time last year. The Courtyard by Marriott is located across the street from the Irvine Spectrum Center. IRVINE, CALIF. -- The 210-room Courtyard by Marriott has opened in Irvine. The $50 million hotel is located at 7955 Irvine Center Drive, across the street from the Irvine Spectrum Center. The new hotel features an 82-foot saltwater lap pool, 1,800-square-foot fitness center, lounge area, bistro, 5,000-square-foot ballroom, 3,000-square-foot events lawn for outdoor activities and 8,500 square feet of meeting space. The development team includes developer R.D. Olson Development, architect WATG and general contractor R.D. Olson Construction. R.D. Olson Development will retain ownership of the hotel, while Marriott International will provide management services. "These are exciting times for the Irvine Spectrum," says Doug Holte, president of Irvine Company Office Properties. "We have worked with R.D. Olson and Marriott to create a hotel that builds on the dynamic downtown vibrancy of the Irvine Spectrum and complements the world-class office workplaces, shopping, dining and entertainment that make this one of the premier workplace communities in Orange County." R.D. Olson has plans for an additional 175-room hotel on the parcel adjacent to the Courtyard by Marriott Irvine Spectrum, with a groundbreaking expected in early 2015. Strawberry Creek houses tenants like Panda Express, Subway, UFC Gym, Starbucks and Comcast. A Super Target anchors the shopping center. SACRAMENTO, CALIF. -- Pacific Castle has acquired four shopping centers in the Sacramento area for $40 million. The acquisitions include Waterman Grove Plaza in Elk Grove, Willow Creek Town Center in Folsom, Zinfandel in Rancho Cordova and Strawberry Creek in Sacramento. The 44,090-square-foot Waterman Grove Plaza is located at 9304-9332 Elk Grove Blvd. in the Elk Grove retail submarket. Major tenants include Panda Express, Subway, T-Mobile and Gamestop. Willow Creek is located at 1001-1011 E. Bidwell St. SaveMart and CVS/pharmacy anchor the property, and other notable tenants include IHOP, Chipotle Mexican Grill, Golden One Credit Union, Wingstop and Anytime Fitness. The 39,737-square-foot Zinfandel is located at 2817-2863 Zinfandel Drive. It is scheduled to undergo a major renovation and repositioning. Strawberry Creek is located at 8211-8251 Bruceville Road. It is anchored by a Super Target, in addition to tenants like Panda Express, Subway, UFC Gym, Starbucks Coffee and Comcast. "We have had a presence in Sacramento for the last decade and as the economy continues to recover, we could see ourselves invested in the region for years to come," says Rod Astarabadi, Pacific Castle's president. "Despite the high competition for these properties, we were well positioned to quickly complete the transactions at a substantial pricing discount. Augmenting our portfolio with the high-quality strategic Sacramento locations enables us to leverage our experience and economies of scale to upgrade the tenant mix, improve the occupancy and provide for long-term growth." Pacific Castle also owns the Rancho Cordova Town Center in Sacramento, a power center anchored by a Super Target. The new 148,000-square-foot Walmart Supercenter will be situated where the old Broadway building used to be. PHOENIX -- Walmart has announced plans to open a 148,000-square-foot Walmart Supercenter at Metrocenter Mall in Phoenix. The project is expected to break ground next year and wrap up construction in 2016. Metrocenter Mall is located at 9617 N. Metro Parkway E. in the northwestern portion of the city. The 40-year-old mall is set to undergo a major redevelopment. The new store will be situated on the site of the former Broadway building, which has been vacant since 2006. That building will be demolished in the first quarter of next year. Carlyle Development Group is the owner of Metrocenter Mall. "Our vision when we acquired Metrocenter Mall two-and-a-half years ago was to bring in a well-known anchor to serve our local community," says Warren Fink, Carlyle's COO. "Walmart more than fulfills that requirement and we are thrilled to welcome them. This is a first step toward revitalizing a once-dominant mall, rebuilding customer commitment and moving forward with plans for the future of Metrocenter that include rezoning to permit complimentary uses such as multifamily apartments, seniors housing, corporate offices, healthcare facilities and medical offices." The new store will feature a full-service pharmacy and complete line of groceries, including organic selections, fresh dairy, meat departments and local favorites. Sprouts will occupy three floors of office space at The Offices on High Street, in addition to a ground-floor retail location. PHOENIX -- Sprouts Farmers Market has relocated its corporate headquarters in Phoenix. The natural and organic grocery store will soon occupy 77,400 square feet at 5455 E. High St. It is relocating from the nearby Paradise Village Office Park. The Offices on High Street include seven buildings that total 330,000 square feet. They are situated within the High Street mixed-use project, which also features 99 multifamily residences and 175,000 square feet of ground-floor retail, dining and entertainment space. Sprouts will join existing High Street tenants like Gigya Inc., Alliance Financial Resources, Nobis Technology Group and Yeager North. Its new office will occupy three floors, in addition to a ground-floor retail outpost. Sprouts is scheduled to relocate next spring. John Bonnell, Brett Abramson and Greg McMillan of JLL represented the property's owners, ScanlanKemperBard Cos. and Wayzata Investment Partners LLC, in the lease transaction. Scott Maxwell of Cresa represented Sprouts. "We are extremely pleased that High Street could meet Sprouts' desire to provide its team members with a headquarters reflecting the company's unique brand and culture, and its requirements for sustainability," says Bonnell. "High Street is easily accessible via the Loop 101 and State Route 51, and is in one of the Valley's most amenity-rich neighborhoods, which is ideal for Sprouts team members and visiting guests." Chandler Corporate Center I is located near Price the Road technology corridor. CHANDLER, ARIZ. -- Chandler Corporate Center I, a 67,561-square-foot office property, has sold to Palisades Capital Realty Advisors for $13.9 million. The center is located at 585 N. Juniper Drive in Chandler, near Price the Road technology corridor. JLL's Dennis Desmond represented the seller, Chandler HFP LLC, an affiliated entity of Held Properties. Dave Seeger assisted with the sale and serves as the property's exclusive leasing agent. "This building came out of the ground in 2008 and has outperformed the Phoenix and Chandler markets ever since," Desmond says. "This includes through the toughest office market recession we've ever experienced. That is evidence of the strength of the Chandler market and was a tremendous draw for investors looking for stable acquisition properties located in high-growth markets." Thermo Fisher Scientific and Dr. Pepper Snapple Group currently occupy the multi-tenant property. PETALUMA, CALIF. -- A 186,000-square-foot industrial property in Petaluma has sold to Lowenberg & Associates for an undisclosed sum. The multi-tenant property is located at 2200-2240 S. McDowell Blvd. Thermo Fisher Scientific and Dr. Pepper Snapple Group currently occupy the property. Glen Dowling, Tony Sarno, George Eckard, Seth Siegel, Adam Lasoff and Grant Lammersen of Cushman & Wakefield represented both the buyer and the seller, 2200-2240 South McDowell LLC, an affiliate of PB&J Acquisitions and Investcorp, in this transaction. Dowling and Sarno are currently marketing the remaining 46,440 square feet for lease. "The property marks Lowenberg's initial acquisition in Sonoma County," Dowling says. "The building's track record of occupancy, including long-term commitments by two major current tenants, proved to be very attractive for the new ownership." The 127-room TownePlace Suites by Marriott is just off Interstate 880. NEWARK, CALIF. -- The 127-room TownePlace Suites by Marriott has sold to Moody National REIT 1 for $11.4 million. The hotel is located at 39802 Cedar Blvd., just off Interstate 880. It caters to extended-stay travelers in East Bay and Silicon Valley. TownePlace opened in 2000. The seller was MN Newark, LLC. Scott Griemsmann of Paramount Lodging Advisors brokered the sale. SAN DIEGO -- Trigild has named Jeff Santoni as its new hospitality asset manager. He will oversee operational performances and monitor sales results for all of the firm's hotel properties. Santoni will also review and analyze key data, including operating budgets, competitive markets, sales, site inspections, guest satisfaction and performance. Santoni most recently worked as a consultant. Prior to that, he was with Marriott Vacations Worldwide where he worked as a senior asset manager for the Western and Hawaii regions. "Jeff brings a unique combination of finance and hospitality experience to Trigild, offering many years of experience in both industries," says Judy Hoffman, Trigild's president. "This varied experience will be invaluable as we continue to concentrate on the growth of our hospitality management division." The San Diego-based real estate firm specializes in property/asset management and fiduciary services. Private sector employees in June added 262,000 jobs and government agencies added 26,000 positions, for a net gain of 288,000 new jobs that will potentially have a substantial impact on commercial real estate, according to a Marcus & Millichap report. During June, the unemployment rate fell to 6.1 percent from 6.3 percent in May, reaching its lowest level since September 2008. According to the commercial real estate services provider, these new jobs will create demand for rental housing, strengthening the 20 basis-point rise expected this year that will bring the national vacancy rate to 5.2 percent. Marcus & Millichap predicts that growth in degreed professional and business service fields, as well as those in the financial services, will fill vacant office space and generate demand in the remaining quarters of this year. An increase in office property operations will result in a 120 basis-point drop in U.S. vacancy to 14.8 percent this year. Robert Bach, director of research for the Americas with Newmark Grubb Knight Frank, says the growth was "robust." He also believes the increase in jobs in the sectors most important to commercial real estate will support net operating incomes as space is filled and rents move higher. This will, in turn, he says, support investment activity. 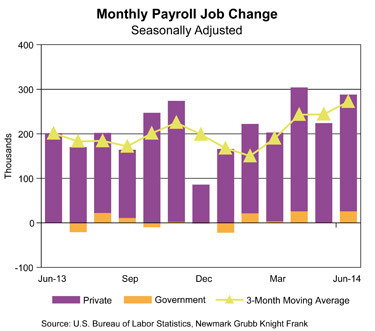 During the second quarter of 2014, an average of 272,000 total positions were added monthly, surpassing the average monthly gain of 190,000 new jobs in the first quarter. The office-using sectors, comprising information, financial activities and professional and business services, added a combined 93,000 jobs in June, well above the previous six-month average of 51,900. Click here to register or for more info. Copyright � 2014 France Publications, Inc., d/b/a France Media, Inc. All rights reserved. The opinions and statements made by authors, contributors and advertisers to Western Real Estate Business Newsletter are not necessarily those of the editors and publishers.